Even hard to find magazines and many International newspapers, Just Ask! My Newsagent Limited manage and provide the www.mynewsagent.co.uk website for the use of newsagents, their customers and the communities they serve. These Terms and Conditions relate to all use of the www.mynewsagent.co.uk website and apply to all visitors, registered users, advertisers and newsagents. Continued use of the website and any of the website services constitutes acceptance of these terms and conditions. Should you disagree with these terms and conditions please leave (close this webpage) the website immediately. Should you wish to discuss any aspect of the terms and conditions please contact us. We, Us - includes My Newsagent Limited or any party acting on My Newsagent Limited's implicit instructions. You - includes the person(s) using the website, the website services or any party acting on your instructions. Newsagent - means the specific newsagent responsible for operating this newsagent website and having access to your account. Website, Site, Facility, Service - means this website and all directly connected services. Server - means the computer server equipment operated by My Newsagent Limited in connection with the provision of the facilities and services. Account - means the area on the server allocated by us to you for use by you as your account management area. User(s) - means any user, whether customer, newsagent, person(s) acting on the customers or newsagents instructions, us or any other user of the facility. To purchase goods or services through this website you are required to register with a newsagent. Newsagents provide no guarantee that they can provide the services requested, any services that Newsagents cannot fulfill will be notified to you once you are registered. Products and/or services ordered from or provided by Newsagents shall form no contract between you and My Newsagent Limited. We may update these Terms and Conditions at anytime, any changes will be on this Terms and Conditions page of the mynewsagent.co.uk website. Changes will apply to the use of the mynewsagent.co.uk website after we have made the changes. If you do not wish to accept the new Terms and Conditions you should not continue to use the mynewsagent.co.uk website and the services. If you continue to use the mynewsagent.co.uk website after the date on which the change comes into effect, your use of the mynewsagent.co.uk website indicates your agreement to be bound by the new Terms and Conditions. To register with a newsagent you must be a UK (or isle of man) resident. You must ensure that the details you provide are accurate and complete. You must inform us immediately of any changes to the information provided by updating your details in your account management area. My Newsagent Limited or your newsagent may suspend or cancel your registration immediately at our or their reasonable discretion or if you breach any of your obligations under these Terms and Conditions. You can cancel this agreement at any time by informing us in writing. You must confirm to us your username, your full address and postcode and telephone number. If you do so, you must stop using the mynewsagent.co.uk website. The suspension or cancellation of your registration and your right to use the mynewsagent.co.uk website shall not affect either party's rights or liabilities. Paragraphs 6, 8 and 10 of these Terms and Conditions shall survive cancellation. When you register you are requested to create a Username and Password, You are required to keep these details confidential. These details are unique to your account and must not be disclosed to any other person. You are responsible for all activity connected to and submitted by your user details, all orders placed will be billed to you by your newsagent or by the system. You are responsible for payment for any products or services ordered through your account. Should you suspect any breach of your account security you are required to notify us or your newsagent immediately, a new password will be created and emailed to your registered email address. The content of the mynewsagent.co.uk website is protected by copyright, trade marks, database and other intellectual property rights. You may retrieve and display the content of the mynewsagent.co.uk website on a computer screen, store such content in electronic form on disk (but not any server or other storage device connected to a network) or print one copy of such content for your own personal, non-commercial use, provided you keep intact all and any copyright and proprietary notices. You may not otherwise reproduce, modify, copy or distribute or use for commercial purposes any of the materials or content on the mynewsagent.co.uk website without written permission from My Newsagent Limited. No licence is granted to you in these Terms and Conditions to use any trade mark of My Newsagent Limited or its affiliated companies or its advertisers, without limitation. The services provided by the mynewsagent.co.uk website do not include the provision of computer or other necessary equipment to access the mynewsagent.co.uk website. To use the mynewsagent.co.uk website you will require Internet connectivity and appropriate telecommunication links. We shall not be liable for any telephone or other costs that you may incur. My Newsagent Limited reserves the right to refuse to post material on the mynewsagent.co.uk website or to remove material already posted on the mynewsagent.co.uk website. any fines or penalties imposed by any regulatory, advertising or trading body or authority in connection with the use of the mynewsagent.co.uk website by you. Although My Newsagent Limited aims to offer you the best service possible, My Newsagent Limited makes no promise that the services at the mynewsagent.co.uk website will meet your requirements. My Newsagent Limited cannot guarantee that the service will be fault free. If a fault occurs in the service you should report it to the My Newsagent Limited Support Department by email at support@mynewsagent.co.uk and we will attempt to correct the fault as soon as we reasonably can. Your access to the mynewsagent.co.uk website may be occasionally restricted to allow for repairs, maintenance or the introduction of new facilities or services. My Newsagent Limited will attempt to restore the service as soon as it reasonably can. The mynewsagent.co.uk website is provided by My Newsagent Limited without any warranties or guarantees. You must bear the risks associated with the use of the Internet. The mynewsagent.co.uk website provides content from other Internet sites or resources and while My Newsagent Limited tries to ensure that material included on the mynewsagent.co.uk website is correct, reputable and of high quality, it cannot accept responsibility if this is not the case. My Newsagent Limited will not be responsible for any errors or omissions or for the results obtained from the use of such information or for any technical problems you may experience with the mynewsagent.co.uk website. If My Newsagent Limited is informed of any inaccuracies in the material on the Site we will attempt to correct the inaccuracies as soon as we reasonably can. To the full extent allowed by applicable law, you agree that we will not be liable to you/or any third party for any consequential or incidental damages (including but not limited to loss of revenue, loss of profits, loss of anticipated savings, wasted expenditure, loss of privacy and loss of data) or any other indirect, special or punitive damages whatsoever that arise out of or are related to the mynewsagent.co.uk website. Nothing in these Terms and Conditions shall exclude My Newsagent Limited's liability for personal injury or death caused by its negligence. As a convenience to visitors, the mynewsagent.co.uk website includes links to other web sites or material which are beyond its control. My Newsagent Limited is not responsible for content on the Internet or World Wide Web pages or any other site outside the mynewsagent.co.uk website. Parts of the mynewsagent.co.uk website may contain advertising and sponsorship. Advertisers and Sponsors are responsible for ensuring that material submitted for inclusion on the mynewsagent.co.uk website complies with relevant laws and codes. We will not be responsible for any error or inaccuracy in advertising and sponsorship material. My Newsagent Limited makes no promise that materials on the mynewsagent.co.uk website are appropriate or available for use in locations outside the United Kingdom, and accessing the mynewsagent.co.uk website from territories where its contents are illegal or unlawful is prohibited. If you choose to access this site from locations outside the United Kingdom, you do so on your own initiative and are responsible for compliance with local laws. If you breach these Terms and Conditions and My Newsagent Limited ignores this, My Newsagent Limited will still be entitled to use its rights and remedies at a later date or in any other situation where you breach the Terms and Conditions. My Newsagent Limited shall not be responsible for any breach of these Terms and Conditions caused by circumstances beyond its control. This website has been professionally developed for Newsagents by My Newsagent Limited, My Newsagent Limited is a company which operates purely to help UK newsagents provide and manage secure online services for their customers. We (My Newsagent Limited) provide no alternative to using cookies and sessions, put simply "the website would not work effectively without cookies and sessions". We can only assure you that cookies and sessions on this website are used only for legitimate purposes. © Copyright My Newsagent Limited 2002 - 2019 all trademarks and logos copyright their respective owners, all rights reserved. If your newsagent does not appear in this list you will not be able to view their details. Our database of UK Newsagents is extensive but if we are missing a newsagents details, please click here and let us know. 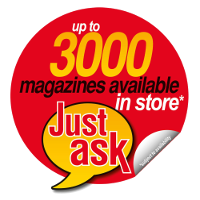 Your Newsagent can order from a list of over 3,000 magazines, your newsagent will save magazines for you and many newsagents will deliver direct to your door. Your Newsagent supplies a far greater range of magazines than is available from major supermarkets who only order and stock the "Top Selling" magazines. Protect your local shops, Just Ask! Your Newsagent. Start typing into the search box the name of a magazine or a related subject. Once you have typed a minimum of 3 characters a list of found magazines that match your search criteria will start to appear. Keep typing, the list of magazines that appear will alter and become more specific with the more information that you type. The list only displays 6 magazines at a time which have the closest match to the criteria you have typed in, keep typing and the 6 magazines will change to reflect what you have typed.